This unique book takes the reader to the heart of the Lake District and its traditions. Along with a detailed history of Herdwick sheep, there is also an extended section featuring many recipes which use traditional ingredients including Herdwick lamb. A portion of the profits from this book are going to the Herdwick Sheep Breeders' Association. When did the Herdwick sheep first graze the fells? One story suggests that the herds that roam the fells came with the Spanish Armada. They are thought to be descendants of sheep that escaped from a shipwreck off Ravenglass in the sixteenth century. Another, more probable suggestion, is that they came with the Norsemen. The breed bears distinct resemblances to breeds found in Iceland, the Faroe Islands and in Norway itself. There is some genetic evidence to support this and it is also said that some of the shepherding terms used on the Cumbrian Hills are similar to those found in Iceland. However, for Hugh Southgate, who has cooked for the Queen, the most convincing evidence is taste. The meat of the Old Norwegian is very similar to Herdwick. There is very little fat and the taste is more reminiscent of roe-deer or reindeer than mutton. The story is more complicated, because the people who should know, the farmers themselves, talk about the Herdwick being indigenous, having developed from a primitive Iron Age breed. Certainly, excavations at Vindolanda on the Roman Wall have thrown up textiles that were made from the characteristic hairy type wool. The name itself is Norwegian. The areas of forest cleared for farming were called herdwykes and by the eighteenth century the name had been transferred to the sheep. What is certainly true is that Cumbrian farmers have been inordinately proud of their tough local sheep. In 1878 William Abbot wrote in The Shepherds Guide, "There is not a breed anywhere in the world capable of taking the place of the Herdwick, a beautiful and useful animal, stands against rain, hail and snow, braves the strongest blasts that sweep over the northern hills. The hardy Herdwick always to the fore, ready to climb to the summits of the loftiest mountains and proudly look down on less exalted, less beautiful fellow creatures. It is by far the best and sweetest." And it is this very sweetness that has inspired this celebratory book by the Southgates. Therese is an enthusiastic spinner, weaver, dyer and felter of Herdwick wool, and Hugh is a master chef. They are keen to make the most of their sheep. Hughs recipes exploit the gameyness of the meat. These are not recipes for any old mutton. In Hardknott Leg with Caper Sauce thyme, bay-leaf, celery and capers are employed to enhance the unique taste of Herdwick. Witherslack Surprise is imaginative and sounds delicious with local damsons, damson beer, cream and honey complementing the meat. And Rosthwaite Roast is Cumberlands answer to Tornedos Rossini. Hugh and Therese are in love with their adopted county. They roam the hills and valleys where the Herdwick feed and they talk to the farmers about their sheep. Up in Yew Tree Farm in Borrowdale, Hazel and Joe Relph breed Herdwicks and also run a restaurant the Flock In. They serve the finest Herdwick meat and as you enjoy the succulent meat you can look out of the window and watch tomorrows dinner munching in the field. This is what the book is about. It is about getting an all round view of our food, appreciating where it comes from, why it tastes the way it does - grazing on heather makes a key contribution to the taste - knowing the history of local cooking - importing West Indian rum and spices through Whitehaven gave Cumbrian cooking a distinct flavour - and then cooking it in the right way. 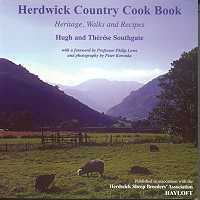 The Herdwick Country Cook Book is a recipe for a perfect day. The watery atmospheric photographs by Peter Koronka invite you to walk the hills and valleys and the guided walks with their historical notes and agricultural observations will work up an appetite that can only be satisfied by the finest Herdwick dishes. And, if youre a little cold, there is always a good thick Herdwick jumper to keep you warm. - Steve Matthews, Bookcase. A marvellous and long overdue book written by people who not only understand the enduring value of the Herdwick sheep but also the spirit of community that makes the Lake District such a special place. - Eric Robson, Chairman, Cumbria Tourist Board. A lively combination of recipes, an authoritative history of Herdwick sheep and the woollen industry and the foreword by Professor Lowe, make this book a real taste of Lakeland. The authors have put their culinary imagination and experience, combined with their obvious love of the Lake District, into devising new recipes using local ingredients, especially Herdwick lamb. They have also researched (and tested!) colourful traditional Cumbrian dishes such as frumenty and haver bread. An excellent book for cooks and country lovers! - Sir Donald Curry.